Music is one of the biggest inspirations to my writing, and my life. I’ve written several times in the past about what music has inspired me. However, besides just inspiring me to think about certain subjects or to act, music also has been known to get my creative juices flowing, leading to story ideas. I have a whole gaggle of story ideas floating around in my head, several of which have been directly inspired by a song. These songs are as varied as the artists on my iPod, which range from pop acts like Usher and Lady Gaga to rock bands like Creed and Shinedown to hip-hop artists like B.O.B. and Eminem to Christian artists like Switchfoot and Red to singer/songwriters like Howie Day and Jason Mraz to 80s icons like Madonna and Michael Jackson. And everything in between. I am toying with the idea of doing several short stories based on these songs and collecting them in one book. I’m still playing with a name for the collection. Obviously it would have to be something involving music and words and stories and inspiration. From my quick research and my own knowledge, I don’t think anyone has ever done anything quite like this. That doesn’t mean this is a great idea. Maybe it means it’s a really bad idea. Maybe no one has ever done it because it is a ridiculous idea. I’m not sure. But it seems to me to make sense, to collect them together since their inspiration all comes from a similar place. And all the stories seem to have a similar tone or mood as well. They all seem to have a supernatural, almost horror, bent to them. Not horror as in hack and slash type of horror. More psychological, ghosts, people returning from the dead – that kind of thing. I have started writing one of them, and the others are still in idea form. But once I have the time to sit down and start writing them, I have a feeling I could knock out the whole collection of short stories in no time. In this new age of multimedia and cross marketing and using multiple platforms to tell a story, why can’t music and the printed word work hand-in-hand? Some of the story ideas I’m working on directly play off the lyrics of the song, meaning they tell more of the story beyond what the song lyrics tell. Others are simply story ideas that spun around in my head after hearing a song. Either way, it seems like there would be enough people who may be fans of a song that would like to read a story revolving around a similar idea. Of course licensing would be an issue, but it would be cool to include a CD featuring all the songs that inspired the stories in the collection. What do any of you think? I’d love to hear what others think about this idea. Saturday was the 38th anniversary of the day that I came into this world. We just had a simple celebration – lasagna, salad and German banana cake. It was delicious. Erin and the kids all went out of their way to make me feel special. I think Addie, our 3 year old, told me at least 100 times, “Happy birthday, birthday boy.” And Emma, our 7 year old, made me a whole pile of precious pictures and cards. And Nassem, our 11 year old, helped make the cake, frosting it to look like a book. I definitely felt the love. It made turning 38 pleasant. Now that I have been here on planet Earth for 38 years, I have high hopes for my 39th year. I know that God is in control of everything that will happen to me this year, but there are some things that my family and I are working towards. God won’t just magically make things happen. He uses people to carry out His will, and unless we are putting in the work, He can’t help us see the results. So my goals for the next 12 months include finding a full-time job, finishing my first novel, helping Erin with her book(s), continuing to network and meet other amazing authors, and continuing to grow as a partner, father, writer, Christian, overall human being. In case you couldn’t tell, I don’t want my 39th year to be a year of stagnation. I want it to be a year of growth and positive change. My 38th year was a year of ups and downs but it overall was a positive year, with me finally getting to work on my first novel with several other stories in outline form, starting this blog, networking with other writers and growing as a person. God willing, I am less than halfway through my life. Hopefully, I have 50 or more years of life left. That gives me a lot of hope. That means I still have lots of time to accomplish all that I want/need/am destined to accomplish. That’s a pretty long list. Every day I am trying to make a positive difference and take steps to accomplishing things that are on that list. Some days that goes better than others. But with God’s help, I know that I can make my 39th year on this planet a great one – one that will bring me ever closer to my ultimate destination. I’m looking forward to the journey. I hope some of you will continue to join me by reading this blog. Happy 10th birthday “American Idol” – Hope I enjoy the party. “American Idol” returns for its 10th season, and while there will be many cosmetic changes, at its heart, the song remains the same. Last year, the runaway hit show began to show its first real signs of age. The show remained the No. 1 show for the 2009-10 season. However, the season finale drew in “only” 24 million viewers, the lowest numbers for the show since 2002. So this year, the producers got out their scalpels and decided to perform a little plastic surgery, hoping to make their show appealing again. 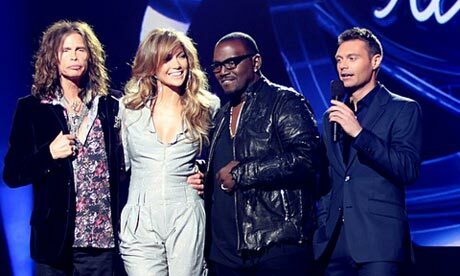 Steven Tyler, left, and Jennifer Lopez, center, join Randy Jackson as judges for season 10 of "American Idol." Perhaps the biggest noticeable change will be the absence of the Man In Black – Simon Cowell. His often caustic but honest remarks toward the singer wanna-be’s became a huge selling point for the show. While the other judges danced around the reality of a singer’s lack of talent – Randy with his “mmmmm dawg, I don’t know” and Paula with her smiles and pleasant comments – Simon was the one with the guts to call a spade a spade. Some people thought he was mean, but I thought he was just what the show, and the delusional singers, needed. I certainly will miss him. But he’s not the only judge from last season who you won’t see on Fox tonight. One-year resident Ellen DeGeneres jumped ship and Kara DioGuardi was shown the door after two years, leaving only Randy Jackson out of the three original judges. After many rumors and much Internet speculation, singer/actress Jennifer Lopez and Aerosmith lead singer Steven Tyler were announced to be joining The Dawg. Only time will tell, but I think these two should be good additions to the judge’s panel. They both obviously have tons of experience in the music business, and they both have larger-than-life personalities, so we shouldn’t have to worry about them being boring. Also, with Simon Cowell gone, the producers brought on Jimmy Iovine as in-house mentor for the contestants. Iovine has nearly 40 years of experience in the music industry and is the chairman of Interscope-Geffen-A&M, lending a lot of credibility. Other changes are largely procedural. This year, there will not be a forced even split between guys and girls. It will be the top talent making it through, regardless of gender. There also are unconfirmed rumors that changes will be made in Hollywood Week and how the finalists will be narrowed down. Apparently, the top 60 singers were flown to Las Vegas to perform on the same stage as the Cirque du Soleil Beatles show “Love.” Those 60 will be further whittled down before the semifinal round, when America finally gets to vote on who makes the finals. No matter what changes the Powers That Be may have made with the judges and the nuts-and-bolts of how the contestants are chosen and advance to the finals, what this show really needs is some really awesome singers who can connect with the audience. Last season, there were no contestants that had the wow factor to make me tune in every week. No Chris Daughtry, no David Cook, no Adam Lambert even. Has anyone bought or downloaded the new CDs by last year’s final two, Lee DeWyze and Crystal Bowersock? I certainly will be tuning in tonight to see what happens with the new judges and to enjoy the annual line of clowns that get paraded before the judges for us to laugh at. After that, it will depend on the contestants that make it through to the finals. If none of them grab my attention, I may not tune in for the whole season. So only time will tell if all these changes can give new life to “Idol” or if it is the show “jumping the shark” and just biding time until it dies. But for now, here’s hoping for a great 10th season of “American Idol.” Happy birthday to you. Reality bites – fiction rules! Last week, I read a blogpost by author Brad Meltzer about if fiction matters. The Saturday Evening Post had asked him to address the issue for an article in their recent edition. At first glance, it seemed like an odd question to me. For me, it is a no-brainer. Of course fiction matters, and not just because I am a writer. Ever since I was a kid, I have loved immersing myself in a wide range of fictional worlds – in books, movies, comic books, TV shows, my own imagination. I think most people would agree that fiction matters. Otherwise, how do you explain the billions of dollars spent every year on movie tickets, DVDs, books, Broadway musicals, video games and other forms of fictional entertainment. Fiction makes you think. For as long as men could communicate, we have told fables and morality tales and parables to show the danger of greed or gluttony or some other vice. Stories allow us to make a point in a way that simple factual statements or arguments can’t. No one wants to be preached to or harped at. But if you wrap your point in the auspices of an entertaining story, you might just get the attention of millions of people. Just think of all the different books that have been used to touch on a sensitive subject like slavery or government control of the masses or terrorism or genetic manipulation. Anytime an issue arises in our society, you can be sure some clever, ingenious author is going to craft a story that makes us think about the subject in a different way, sometimes without us even realizing we were thinking about it. That is why fiction matters – fiction writers have power. The power to effect change. The power to make people think. The power to explore new ideas. The power to pass on knowledge. And knowledge can be dangerous. How else do you explain all the banned books? What do you think? Does fiction matter? Do you agree with my reasoning? Let me know. I’d love to hear your thoughts. Of course, if you’re reading this, you probably are a writer or an avid reader, so I expect most of you will agree that fiction matters. But I’d still love to hear from you. And while we’re talking about fiction, I’ll give a plug to Brad Meltzer’s new novel “Inner Circle” that released last week. I can’t wait to read it. The excerpts definitely got my attention. There is a saying that the family that prays together stays together. And there likely is a lot of truth to that. But what about the family that writes together? I only ask because, well, everyone in our family likes to write. I’m two-thirds of the way through the first draft of my first novel with several other Works in Progress in various stages of …, well, progress. Erin, my fiancee, is also a writer and is working on a children’s picture book, as well as a related chapter book for young readers. And all of our kids love to write, too. Even Addie, our 3-year-old, who obviously can’t really write yet, but she certainly can make up stories as she plays with her dolls or sings her stream-of-consciousness songs that certainly tell stories, too. I am so excited about Erin writing her books. She had been wanting to write a children’s book for years, but the perfect idea had never presented itself until now. It is a great idea, too. She was inspired but things around her and things she knows, which is always a great thing. It’s great to see her so excited and on fire to bring her idea to life. I can’t wait to see her finished product in print. I can already see what it’s going to look like and picture it on bookstore shelves everywhere. So be sure to be on the lookout for Erin Al-Mehairi’s books on shelves at a store near you. In a perfect world, we’ll both end up with published books in stores everywhere by the end of the year or sometime next year. I can see us doing joint book signings around Ohio, heck, how about around the country. A guy can dream, right? I have faith in her and I have faith in myself. I know we can do it. It’s just going to take a lot of hard work and maybe a little luck to make it all come together. The hard work part we can do. The luck, well, that is out of our hands. All we can do is do the hard work and then pray. Together. There are many different phases or steps involved in writing a novel. First you have to get an idea, then you have to nurture and water the idea and help it grow into a full blown story. For me, one of the most enjoyable parts is the research. I love getting my hands dirty and digging into a subject and becoming as close to an expert as one can by simply doing hours or days of research. Recently, I have had to do research on the geography and weather in Iran, as well as the ferry to Liberty Island. For other parts of my novel, I have done research on India, the layout of early 18th century Spanish galleons, the Treasure Coast of Florida, and devices to create a large-scale EMP. And I’m sure I’ll end up researching other things before I finish this book. For many writers, I’ve heard them say they hate doing research. All they want to do is write. And there’s nothing wrong with that. There’s no rule even that you have to do any research before writing. For some types of books, especially if you are writing a book based on something you already know a lot about, research isn’t really necessary. Personally, I’ve always been an information junkie. I want to know everything about everything. Just like Sid the Science Kid. And unless you have young kids in your house who watch PBS, you probably have no idea who that is. But that’s OK. I absorb as much information as I can every day. News, current events, research for my books, whatever. Unfortunately, the older I get, the less I actually “absorb.” Somedays it seems I can’t remember where I left my head, let alone anything I read that day. That’s why I bookmark lots of Web sites and make lots of notes. I probably obsess over the details more than I need to. But i don’t want anyone to read my book and go, “Oh that’s not right. That’s not how you do that,” or “That’s not what that looks like.” I guess it’s a control thing. I can control getting as much information as possible and accurately putting it into my book as a way to deflect possible criticisms. It makes me feel better and more secure when I have all the facts. And I’m sure all my years in newspaper journalism also plays into my attention to getting all the facts correct. One chapter in my book is a flashback to the Spanish fleet that set sail from Cuba and crashed along the Florida Coast in 1715 with a vast treasure on board, most of which remains undiscovered. It took a lot of time and searching online but eventually I was able to uncover details I was searching for, such as names of the captains of the ships and officials in Cuba at the time. Unfortunately, some of the details I uncovered were conflicting, which forced me to make decisions about which ones I chose to include and which ones to leave out. In the end, I think I was able to paint an accurate picture of the people and places involved, with some artistic license taken. It was almost 300 years ago, after all. Not too many witnesses left to argue with me. The one problem with enjoying research is sometimes I have to rein it in. Too much time spent in research takes away from time that could be spent writing or other things. Other times, my research branches off and I find new ideas for my current Work In Progress or maybe even a lead on a new story idea. So it’s a careful balance. Time to go do a little more digging. The ferry to Liberty Island is calling to me. Yesterday, I found myself eating leftovers for lunch. Now, there is nothing remarkable about that useless bit of trivia. But what was remarkable was what I was eating as leftovers: sauerkraut and tortilla chips with a spinach artichoke dip. For those who have known me a long time, you may know there was a time when I would never have let sauerkraut or anything with spinach in it pass over my lips. For years, my diet was very simple: pasta with red or white sauce, hamburgers, hot dogs, meatloaf, chicken nuggets and some fruit. Lots of peanut butter and jelly and lunch meat sandwiches for lunches. No vegetables, no chinese, very little mexican, nothing outside the very basic and boring. Then five and half years ago, I moved in with my fiancee Erin. She is a wonderful cook. She has opened my palatte to a whole new world of flavors and dining experiences. I’ll try just about anything now. No guarantees I’ll like it, but at least I’ll try it. And a lot of the things I have tried I have liked. Now, I wonder why I wasted all those years eating boring, bland foods when I could have been trying new things. I still love some of my old favorites: meatloaf and spaghetti and pizza. But I’ve added some new favorites: enchiladas, shrimp pasta, and many more. In case you couldn’t tell, I can be a pretty stubborn creature of habit. Once I get in my comfort zone, it can be very hard to budge me. But that’s something I’ve improved about myself in recent years in all areas of my life, not just my eating habits. That’s why I finally started writing again. For years I was too busy and too afraid of failure to really write. Now, in 2010, I finally got back to writing, with this blog and with my novel and other works in progress. It is a daily effort to keep myself motivated to pursue change, to not procrastinate, to tackle whatever challenge lays before me. That’s one of my big goals for the new year – to keep moving forward, to keep writing and to make positive change for myself and my family in 2011. I plan to take a big bite out of life in the new year. I can’t wait to see what it tastes like.